The Dalai Lama has observed that the greatest challenge facing our time is that we're raising a generation of passive bystanders. If he is right, then the most vital work in this moment belongs to parents, grandparents, mentors and teachers. Inside this inspiring guide, you'll find life lessons from remarkable individuals, committed parents, and compassionate children. 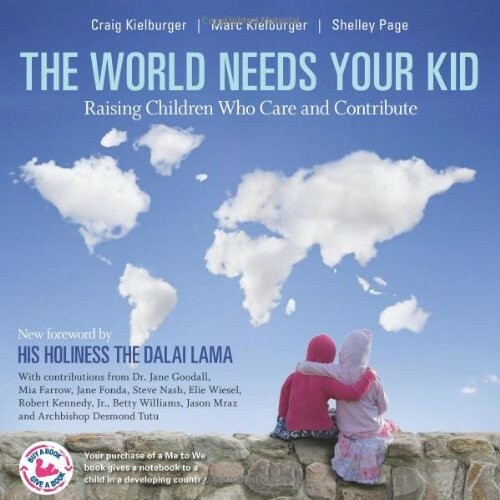 Contributors include Archbishop Desmond Tutu, Mia Farrow, Jane Fonda, Robert Kennedy Jr., Jason Mraz, and Dr. Jane Goodall. Read revealing stories and insights from the not-so-typical childhoods of Craig and Marc Kielburger. The brothers, whose work now inspires more than a million youth every year, share groundbreaking lessons on teaching kids to care. Discover how small actions every day can make the world a better place. Find out how those same small actions can have a lasting influence on your child's life. After all, it's a proven fact that doing good for the world does a world of good for friendships, grades, and self-esteem.